Two students from the University of Illinois Springfield have been awarded Avery Brundage Scholarships for excellence in academics and athletics. Each winner will receive a $2,500 award for the 2012-2013 academic year. 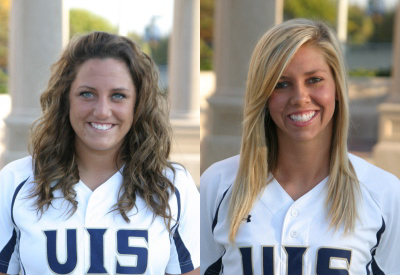 The recipients are Mallory Beck of Springfield, Illinois, a junior biology major on the Prairie Stars basketball and softball teams and Tina Buck of Imperial, Missouri, a senior communication major that plays softball. The Avery Brundage Scholarship Fund Committee, composed of nine representatives from the faculties and student bodies of the Chicago, Springfield and Urbana-Champaign campuses, selects students from each U of I campus who engage in athletics for personal development, not as preparation for professional sports. In addition, the students must be working toward bachelors, masters or doctoral degrees at the University of Illinois and must be in the upper 25 percent of their undergraduate class or in good academic standing in their graduate program.